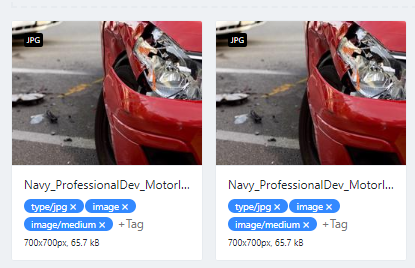 I have tested the system and it does allow for image assets to have the same name, but I’m hoping that they have their own internal ID/Ref number? Can you confirm this for me so I can confirm with the Tech Team. Also on the back of this, is there a quick way in which we can check asset names, as I have over 350 assets in my application/site. To double check them for names is going to be a bit of a nightmare. Asset names are metadata only and not unique. Starting with 2.0.1 assets can also have a slug that can be used to query assets, but there is no uniqueness check (yet). There is no built in feature to query for assets but I would use the API and/or Squidex client library to query them and check their names. Just so that I am clear does this mean that the asset does have an internal reference ID that they system uses to make reference to it, or does that system make reference to the image by its filename (metadata) and hence if two images have the name name, there is the likelyhood that the system may not work correctly? If you link reference an asset field the internal unique ID (guid) is used. It is also used when you reference an asset in a rich editor such as Markdown or HTML and when you click the download button in the UI. Great news thanks - we are loading the assets through the internal system, by uploading the assets and then referencing them internally. Hence no duplication should happen even if the filename ‘may’ be the same (content managers may not realise that the name already exists).